A picture book containing six chapters might sound rather too much for young children. But Allan Ahlberg and Raymond Briggs A Bit More Bert is full of illustrations and has just a little text on each page. The chapters have a title page and then another three pages, except for Chapter 5 which has seven pages. Each chapter is actually more like a mini story, so if a child has a very short attention span, you wouldn’t have to read the whole book at once. We read about Bert and his dog, who is also called Bert, we give Bert a haircut, and then we see how Bert is constantly nagged by his mother (named Grandma Bert). In the next chapter Bert buys crisps and shares them, and after that Bert loses his dog but luckily finds him again. A Bit More Bert ends with bedtime, when Bert is still crunching crisps in bed alongside Mrs Bert which might give children ideas. Allan Ahlberg has injected these little stories with plenty of humour. Grandma Bert nags at Bert to eat his cabbage and she thinks he does, but we see that he actually wraps it up in his red spotted handkerchief. When I started reading the book I thought Bert was a boy, but when it becomes clear that he is an adult with a wife and child the humour is even sharper. Illustrator Raymond Briggs adds more amusement in the accompanying pictures; we see semolina or boiled liver flavoured crisps and a Grandma Bert who loves patting Bert on the head as she ladles some green mush onto his plate; her hair is always in rollers. As well as humour, there are some touching moments, in particular when Bert finds his dog again and they have a great big hug. We the readers are directly involved in several of the chapters; when the hairdresser is shut we have to give Bert a haircut, and we end up leaving Bert almost bald. When Bert shares his crisps, he doesn’t forget to give us one as well as his family. This is essentially a picture book that is perfect for reading aloud to pre-school children, but it is also one that could be suitable for slightly older children who are learning to read. The font is a n especially large, clear one, and the sentences are almost all short and simple. There is a good amount of recurring words, as the dog’s name is also Bert and there are two chapters about him. When Bert loses his dog, he goes to the police station where most of the staff also have pets called Bert, including the Inspector whose six goldfish are all called Bert. (The man definitely needs a little more imagination.) One or two short dialogues are included that will show children how to use speech marks correctly and that a new line is started for each speaker. The author and illustrator of A Bit More Bert are likely to need no introduction. Author Allan Ahlberg is well-known for “Each Peach, Pear, Plum” and “The Jolly Postman”. Raymond Briggs, the illustrator of A Bit More Bert, has delighted children with “Father Christmas” as well as “The Snowman”. They are well suited to each other and know how to bring out the humour in each little story as well as showing love towards family members and pets. 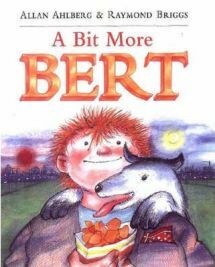 A Bit More Bert does not seem to be widely available any more, but there are copies on Amazon Marketplace at very low prices. There is a hardback version as well as the paperback. It is perhaps more of a boys’ book than a girls’ one, although any dog lovers would appreciate it, I’m sure. As a read-aloud book it would probably appeal to three and four-year olds, but I do also think it is an interesting book for slightly older children who are learning to read. No Comments on "A Bit More Bert"